Unfortunately I don't have any knitting photos to show you in this post. This does not mean, however, that I haven't been knitting. Recall in my last post that I stated I was not going to make any more beanies for a while? Well, it was mere minutes after publishing said post that I cast-on for a Hurricane Hat with a beautiful skein of Malabrigo that was gifted to me in a care package. I had no recipient in mind for this hat, but one of my brothers saw me knitting it when I was near the end and I threw it in his direction when it was complete. One of my sisters, upon seeing this, reminded me that I still hadn't knit her a Kiwi hat that she requested way back in September (this, I will tell you, is not true. It was more like mid-late October, but I digress). So, without even getting up from my seat after finishing the Hurricane, I immediately cast-on for yet another Kiwi with the same yarn (Malabrigo in Vaa, beautiful color). I ran out of yarn in the middle of the decreases, but thankfully the hat I made my brother was a bit long and slightly pointy - it needed to be redone - so I ripped the top off of that hat, finished the Kiwi with some of that yarn, re-did the top of the Hurricane and sent both hats on their way. Of course, I did all of this before I remembered to take pictures of them. Wow, what a long story to simply tell you that I did indeed knit two more beanies after saying I wasn't going to make any more. As far as my brother's sweater goes, I have finished the body and one sleeve. I have one sleeve, one yoke, 8 balls of yarn, and 1 week left before this sweater is finished. Wish me luck! Ok, now on to the actual topic of this post. 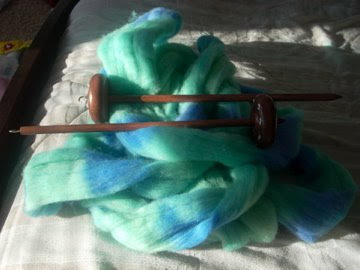 Way back in May I started spinning on a drop spindle without much luck. I managed to spin up a few singles and 15-20 yards of unusable plied yarn (which I think I threw away when I was moving a few weeks ago) before I dropped my spindle and it broke. "Oh well," I thought, "I wasn't very good at it anyway." Well, for Christmas, my brother-in-law bought me a spinning kit completely with a top whorl and a bottom whorl spindle, some dyed roving, and a bit of undyed roving. I immediately jumped back into it and spun up most of the undyed roving. I wanted my brother-in-law to see the whole yarn-making process before he flew back to San Diego this morning, so I spun up a second single with the little remaining undyed fiber and then attached some of the blue and kept on going. When I thought I had enough, I wound both singles off the spindles (I had spun each single on a different spindle so I could try them out) and began to ply. 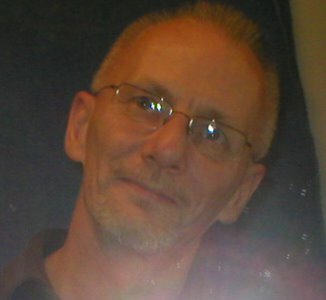 Much better than my first attempt, much thanks to CriminyJickets who was kind enough to answer all my questions and give me hints about how to make spinning easier. I can't wait to spin up some more yarn, but for now I'm going to have to concentrate on getting this sweater finished before I head back to Wisconsin. Wow, your handspun looks great!! You should be very proud of yourself for giving it another try and sticking with it. And those spindles look remarkably like the one I use for plying. Your handspun looks amazing! It certainly puts mine to shame. I should really get the spindle out and play with it more often. 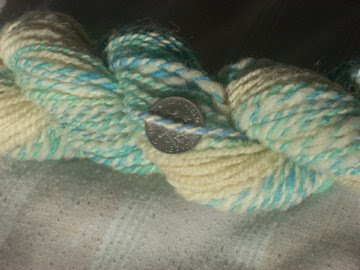 What gorgeous handspun. Can't believe you got that with a drop spindle! You must have a TON of patience. Nice work! You really have a knack for spinning - I'm admiring your handspun and comparing to the lumpy mess I made over break, and thinking that I need to practice with my spindle some more.